Sturdy guide rods keep the clamp faces neatly parallel, while the quick-release feature lets you slide the vise all the way open with an easy 1/4 turn. This heavy-duty, easy-to-install steel vise will be the workhorse of your custom workbench! Machined pivoting nut engages or releases with a 1/4 turn of the 1" dia. main screw so you can easily re-position your workpiece. Extra-wide 12" O.C. guide rods provide maximum resistance to racking, while extra-wide 17-1/2" handle plate delivers maximum stability to handle any project. New 12" on-center guide rods for mounting on the end of a bench. Also can be used as a front vise. Handle plate is drilled out and countersunk for easy attachment of wooden jaws (not included) with #12 wood screws. 13" overall travel before wooden jaws are added. Easy to install with included instructions. There is an additional $10.00 shipping charge for this item. Vise plate mounts to bench with 1/4" lag bolts. 19" screw and body length. It is well made and works good. Easy to assemble and well designed. Twin acme screws prevent racking. Great vise to use. Easy to adjust quickly when hands are holding project in place. The 12" Quick Release End Vise was delivered on time and installed in about 1 hour. Hard to find quality like this these days. Recommend purchase. Works great. Really strong. Heavy duty all the way. Great end vise, easy installation. Just watch the video and follow instructions. Works just great. This is really an excellent and well built vise. Easy to install and is rock solid. I am very happy with it. I don't have much to say beyond it is sturdy, works smoothly, and the release works easily. It is a good vise. Bought this for a new workbench I made out of hard maple. The vise is very sturdy, fairly easy to install, and is STRONG. I expect it will last for generations, just like the bench! Installation was easy and quick. My bench top is made from a sold core door. I used 24" lengths of poplar for vice face. It grips well and is soft enough to not mar most other wood species. I was surprised at how much clamping pressure could be achieved with relatively low handle effort. The quick release also works well once I got the hang of it. 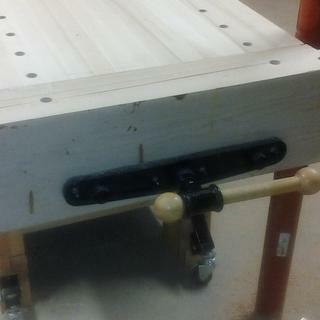 I added bench dog holes in the bench top as well as vice face for working longer pieces and it works well for that too. The vise is well built and functions well after installation. After reading the instructions on the back of the box, I had to figure the correct installation method given my workshop tools. It was not intuitive. It has been a great vice. The quick release part can be tricky to deal with. The vice opens sufficiently wide enough and accommodates the vice pads. 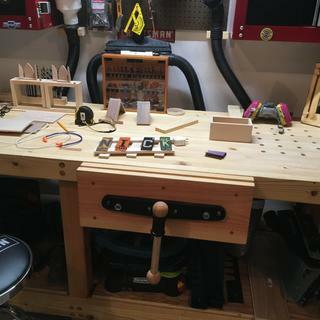 I built a new workbench and wanted a vise equal to my bench quality. This vise fit the bill. As mentioned, instructions and templates with diagrams would have been handy. Even some simple color coding of the threaded device would have been great. I installed mine as it came out of the box and discovered it was put together backwards from the factory. I had to lay on my automotive creeper under my table to figure things out. I was sporting a mild bruise on my chin for a few days after that heavy chunk of threaded iron came loose and landed on my face! Very well made, works great. I had never had a wood workers vise but I decided to splurge even though I only do some wood work. The vise was fairly easy to install and works as specified. I am a DIYer and I use it for all sorts of different jobs. I first I thought I overdid it in selecting such a large vise, but now I am glad I did. Great vise, everything that i expected. Would recommend. A couple of years ago I installed one of these end vises on my Sjobergs bench. I liked it so well that I purchased another for my new woodworking bench that I just finished. Like several others have stated, Even though the instructions are something to be desired, this is still an excellent vise. Probably the best one of it's type. And I surely wouldn't have bought another if I didn't believe that. I took my time and installed this in about 2 hours, which includes milling out the cheeks. I would recommend that the manufacturer include hole templates as accuracy is key and it took some time to create my own. The quick release feature is excellent, though it does slow down the installation process quite a bit when you are working alone. I would NOT buy this product without the quick release option, unless you REALLY like spending a ton of shop time cranking your vise open and closed. This is one heavy duty, and well built piece. I showed it to my uncle who is a 40 year woodworking veteran and he was definetly impressed maybe even a little jealous? With it's craftsmanship and precision. 13&quot; travel is enough to travel through 2 thick cheeks and the table apron, while still giving a large opening for material. This vice is great,very easy to install works like a dream. The bench isn't pretty, built out of scrap left over from adding 1000 sq ft to our home, clamping surface is 2x6 redwood, bench top is an old solid core door with 6x6 redwood legs, ugly yes but a real hard working bench that doesn't move and really works great for me. Out feed roller from Rockler works great with the band saw when re sawing 50 year old redwood 2x12 headers. One hint if you are putting bench dogs in after you drill the 3/4&quot; holes in the vice face drill 1/4&quot; or 3/8&quot; hole in the outer face lined up with your dog holes easier to get the sawdust out that builds up in them there holes. Overall I give this vice a five stars, and highly recommend it! This is a great vise, heavy duty and smooth operation. I really like it and would recommend it to anyone. Very happy with the product. As others have stated, keep the box for 'basic' directions. Vice worked great. Wanted to use maple for jaws, but 8/4 maple cost as much as the vice. Used poplar and so far very happy. Solidly built, smooth operation, well machined. Make sure you have enough room to install this beast under your bench; I had to make a few modifications to fit it in. Vise is very good. Directions are not great. Sould be inside the box not on the outside. Need to know what type of wood to use for the Jaws. What size of holes to drill. Just received the vise, Easy to install. Sturdy construction, the quick release seems to work great, takes a minute or two to learn how to work it, other that that, so far a GREAT vise, would recommend with no problem. Thanks Rockler. This vise has meet all my expectations, and is worth the cost. While I agree drilling templates would have been nice, they are easy to make directly from the main casting. Align and drill carefully. This vise is really incredible. The quick release mechanism is so easy to use. It only takes a minute to learn how to use it.It is a little bit awkward to hold the quick release parts under the table while re-assembling it. Great vise. 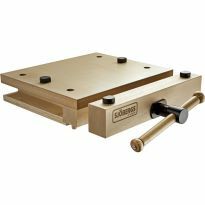 For years I have looked for a vise with the large wooden handle just like the ones I used in woodshop in high school. The diameter of the handle is more comfortable to use. The vise is sturdy and well made. Instructions for mounting would have helped. Locating the mounting screws is done easily by placing a piece of paper on the mounting plate and rubbing a pencil along the edges of the plate and the holes. Take the paper and place it under your bench top and transfer the markings. I'm designing a new bench and I'm having a problem with designing the legs and frame to support the top. The vise extends under the bench top and interfers with the frame supports for the top. Again, I think instructions with measurements for clearence requirements would be helpful. Once you get past the mounting issues I believe this vise will be working in my shop for years. This is a really great vise at a great price! Like the others have said it would've been nice if they'd included a template but it was so easy to make one that it's really not a problem. Went together like it'd been installed by a pro and believe me, I'm not. I dressed it up with curly maple faces and it makes my bench look like a million... and it's so easy to use, too! This vise is excellent in every way. Fast and easy to release and tighten. Real gripping power. Smooth operation. Worth the money and time to install. Making a template for the jaws was easy by setting the mounting base on edge and tracing around it on paper. The installation instructions were also excellent. I am one happy camper. This is a quality vise!! It took about 4 hours to install using the measure twice cut once philosophy. I do think a template would have been useful, but it wasn't to difficult to install. It transformed my table into a very useful woodworking tool. The quick release mechanism works well and it very convenient. You get what you pay for. This vise is heavy duty. Very well make, smooth operation. The quick release comes in handy whether opening or closing the vise. The included handle is a nice touch. The suggested sizes for the screws and lag bolts seemed a bit undersized. I went with larger diameter ones. All the pre-drilled holes accepted the upgrade with no problem. The only negative comment is the description on which way the screw mechanism fits into the base. The instruction is very vague. I had to take the vise apart after installing it, and reverse the mechanism in order to have the quick release work properly. Otherwise, installation was very straight forward. strong but quick release easy to misinstall, pay attn. to min. clearances and direction of release nut. This vise is a beast! Great amount of clamping force. Very solidly made. Easy to install. The only complaint I have is with the quick release mechanism, it would have been nice to have instructions on how to properly install it. I got it installed after a little bit of fussing with it. I would highly recommend this to any woodworker. Make sure clamp has adequate clearance underneath to slide when mounting on a thick bench. Installation instructions were not clear and complete. But the vise is great! My new workbench and the Quick Release end Vice 12"
The install gets a little tricky without instructions but the pictures on the back of the box help. The quick release must be removed to install this through the lumber during the install. I took a picture of the hardware from multiple angles to be sure I could reassemble this part. Considering this gets installed under the bench after install it was still challenging but it worked out. The vise is functional and works as expected. The installation information is minimal but that does not mean the product is lacking. This is a very nice end vise and the install went well because I made my own template and flipped the bench top over to do the work. No problem with the quick release parts as I just set them aside as the guide rod and screw section was put on and off during the fitting process. Follow the advise of others and get all your hardware before starting construction. I ended up making some minor adjustments but it all work out great in the end. The store guys in Orange and San Diego are great. This is the last major piece to my retiree shop following the new machine phase. By the way, these benches sell for up to $3500 and I built this as it sits for $800. Maple and Purpleheart. Ready to go for the new granddaughters. Thanks again Rockler. Outstanding reviews and sturdy/large-enough vise for a full-width end installation. Combination of availability, Rockler quality by reputation, and the only other quality vise like this on the market would have cost me another $150 or so. As a woodcarver, I work with large, heavy pieces of wood and need a vice that is strong enough to handle the weight and forces being applied. Love my end vise. Extremely well made. Very heavy. A necessity for the woodworking I do. I chose this vise for 2 reasons. First, the size and it being the lowest cost of this size with a quick release. Second was that I received an offer for free shipping on items over $35. HOWEVER, I was still charged $10 for S&H, which is the same as the shipping cost for the same item from Rockler through Amazon, without the promotion code. To further confuse the situation, Amazon charged $2 more for sales tax, so I paid the $10 S&H and bought it from Rockler directly. For my first woodworking bench. I'm wanting a vice for the end of my workbench. needed a good vice for my new work table, and so far I love the job it does. I wanted a reliable vice that was within my budget.. I have two vices on my bench. This one is for wider items like making doors. I need a good vise for my new workbench I'm building. I'm excited to find this one since it incorporates wood, which I can easily add to the vise. I needed it for my workbench and it appears to be a great price. Building a new workbench for shop. These are great and i need one for my bench. Wanted a wide front vice. I am concerned about the comments on the quick release with no slow release option, but no time to search more. Best Value. I did not want my vise to cost more than the rest of my bench! I need this end vise for the woodworking bench I'm building. reviews that were on the website were helpful and it seems a good value for the money. hopefully to add to my enjoyment of woodworking at the bench and the past positive results with Rockler products. Haven't used this item yet, still building my workbench. A must for every one that has a work table. I built my workbench 20+ years ago. It's about time I installed a quality vise since my bench is very likely to last another 20+ years. Was used on a sample workbench. Just what I needed on my workbench. Plenty strong and easy to install and use. BEST ANSWER: There is one - but it is not very clear. I installed mine wrong and the quick release did not work. I had to redo the install. 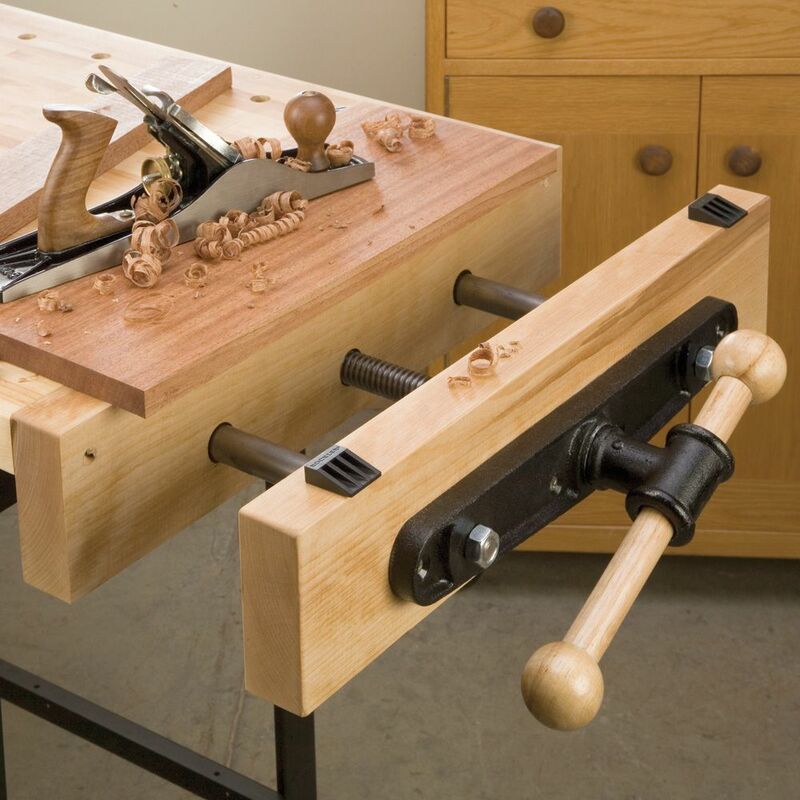 How much room do you need under the workbench to accommodate the vise? I have 13" of overhang to work with. BEST ANSWER: I have mine mounted to a 1 1/2" face board. You will need 16" from the back of the board to mount it. The base plate is either 15 or 16 inches long. Vise depth from flat side of chop to back of carriage is almost 19" so it really depends on how thick your chop block is to determine where the back depth under the table will be. I.E. max depth without a block is 19"
About 2 3/4" on my install. I bolted directly to the underside of my 1 3/4" thick top. The lowest point on the vice is the quick release that hangs down a little. I'm deciding between this one and the Sjobergs Smart Vise with Jaw Cushions. They seem similar. What do I get for paying $20 more for this one than the Sjobergs ? Thanks. BEST ANSWER: The Rockler vise has large metal casting stretcher components which make up the anti racking brackets and mounting base. Sjobergs Smart vise has wood. Not sure if this improves function or not because I only have the one but in theory should help with racking. 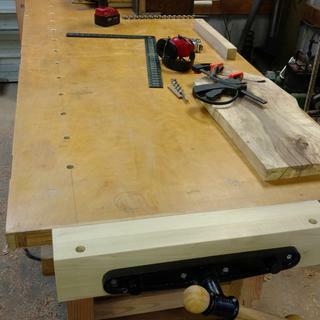 I also integrated the Rockler vise into a workbench with a 3" thick maple top. So I needed to have the vise components only and make my own jaws rather than have an integrated unit like the Sjobergs Smart Vise. With this vise integrated into my workbench it will be something I know can be handed down to my grand children 50 years from now which was the most important purchasing decision. My grandfather and father always taught me to buy tools you know you would only have to purchase once and you will never regret it. How much racking do you get with this vise? Can it be installed on a three inch thick bench top? Thanks. BEST ANSWER: With a small wood block centered over the left guide rod, and the vise tightened snuggly, the right side of the vise is only 1/16" closer to the bench. 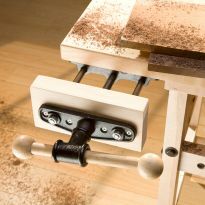 The guide rods are 12" apart and do a good job of keeping the movable part of the vise in alignment with the bench. The vise base bolts to the underside of your bench. 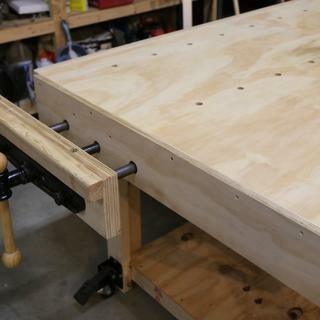 I use two 3/4" sheets of plywood for my bench top and the vise attaches easily to them. I use a 2x6 apron around the bench, but that has no affect on the vise mounting. It only provides more depth for the wood vise face. I don't see a problem mounting on a 3" top; mine is on a 1 1/2" top. I don't know vise terminology but I used 2x6 material for the vise faces and it comes out looking just like in the picture. With a 3" top you probably need to use 2x8 material since you will be mounting 1 1/2" lower.. Racking is minimal in my opinion and yes you can install it on a 3" top. Wood jaws are not included with the vice so you will have the opportunity to make them to match your bench top thickness. I have noticed no racking problems. It can be installed on just about any thickness bench top. where can i get the manual/instructions that comes with this product? BEST ANSWER: There is a new youtube video. Search: Woodworkers Journal Mounting a Workbench Vise. The install instructions where on the back of the packing box. Thanks. I bought mine at a store as an open item and didn't come with a box. Thanks for the info though ! You can also look at the installation instructions for Item # 27838 , which is the smaller front vise. The instructions there can be applied to the end vise, and a downloadable PDF of the instructions is available also. I never found any instructions either. As I remember there are some pictures on the box that helped, and I also found pictures online of other similar vices that helped. In the end it really wasn't that hard to figure out how to install it. Hope this helps. Is there any reason you can't mount this on the front of a bench? BEST ANSWER: I did mount this on the front of my bench, and it works fine. However, the legs got in the way, and I could not mount the vise such that the end of the vise was at the end of the bench. Not a big deal, but it does make crosscut sawing an occasional problem. No, I can't think of any reason. My bench top was a similar thickness to that in the picture (2"). 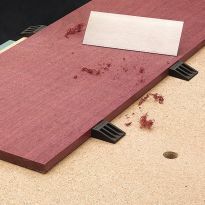 If your bench is a lot thicker you would just need a taller face board on the moving part of the vice. The vice works nicely-very happy with it. Not that I'm aware of. 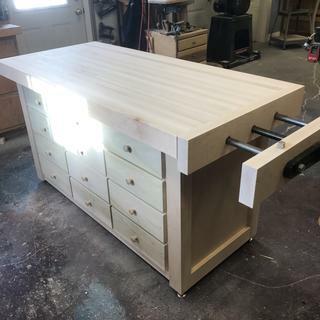 The only issue I would question is the overall width of your bench to make sure you have the clearance for the under bench bracket and the vise rods. No reason that I can see. Just make sure the bench is wide enough to accept the hardware. Does it really weigh 40 lb? BEST ANSWER: Yes, or very close to that weight. What you don't see in the picture is the heavy cast iron cradle holding the screw and guide shafts. There's also a directional pin to help with the quick release mechanism. It is a very robust vise and needs a reasonably thick table. I used two thicknesses of 3/4" plywood for the table top. It has been 10 months since I installed the 12" vise so my memory of its weight is a little foggy. I am remembering it in the 30-40 pound range; not as heavy as a bag of feed which is 40 pounds. It's been awhile since I bought and installed it, but as I recall, it weighs every bit of 40lbs. Solid construction. Very satisfied. Works as advertised. Very Close. Remember it is heavy cast metal and most of it is hidden under the bench. what is the distance from the top of the mounting plate to the top of the guiding rod? BEST ANSWER: Honestly, it's still in the box, so I don't know. I expect to install it after the holidays. 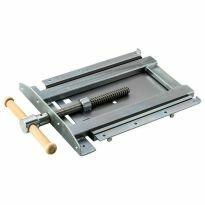 Is there an ideal bench top thickness for the 12 inch End vise? Would a 3 inch top be suitable? What would be a reasonable range for a top should I reconsider the 3 inch top? BEST ANSWER: I mounted mine to the end of a 4" thick bench. It works just fine but does require wider material for the jaws. A 3" top can work, but that's more thickness than you need from a structural point of view. That thickness will add a lot of weight and cost. My top is 1" which I suggest as a minimum. If I were building it again, I'd go 1 1/2 or 2" maximum. 3" might be a little thick but would probably still work. 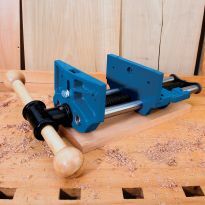 The Rockler 12 inch end vise kicks - period! I purchased this, mounted it, and using it regularly. Thanks for providing this awesome product. My bench top is 5 1/4" thick. 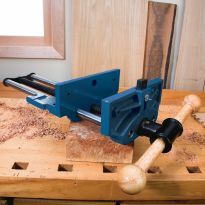 I plan on buying the Rockler end vise. I excavated the underside area needed to mount the vise to 3" to prevent racking. I understand that I need 16" depth to handle the rods and screw but I don't know the width needed to provide clearance for the mounting carriage. Would 10" take care of it? Thanks! BEST ANSWER: 3" is plenty of clearance underside and 16" is also good enough for the rod lengths. However you'll need at least 12" spread to clear the mounting carriage on the sides.. I also have a 5.25" roubo style bench. I used 1" hard maple for the jaws and this vise is highly secure and very sturdy. I actually purchased the vise first and then cut it out as needed. I am a little over 2" excavation and that gave me enough clearance to prevent binding but that's cutting it pretty close. This is a great end vise for me and I don't think you can get much better operation out of an end vise than this. The vise length from chop block to back of rods is 19" in depth, the width of the carriage is16"+. This vise will not rack back and forth, it is very heavy and sturdy. By removing the underside of your bench and leaving the top at 3" thick your vise will be fully recessed under the bottom of your bench top with only the quick release portion sticking out about and 1/8" to 3/16". Dose the 12" bench vise come with mounting instructions? Does anyone have a picture of the quick-release nut as installed? I disassembled the unit without taking note of it's installation orientation. I have my vise installed now, but am still not sure if I have the quick release nut properly installed. BEST ANSWER: As you stand in front of the vise, the larger half of the pivoting nut (with the hole that accepts the screw) has its tab (looks like a thumb) facing to your right. Thanks, Ross. But I don't see the photo you mentioned in your answer. Does this Q&A allow uploading photos? Thanks again. Mike T.
I have 32 inches of space at the end of my workbench. Where should I position this new vise? In the middle or at one end? BEST ANSWER: I mounted mine in same way as shown in catalog. I installed two boards the same width as my table top. This allows for installing vice dogs to align with table's dog holes. I like mine at the end of the bench, to leave most of the front clear for claiming, etc. that is more flexible. I use the end vice every time I go into the shop. BEST ANSWER: The box says "Made in Taiwan". There are no markings on the vise itself. What length carrage bolts are recommended for this weight. I have 3 3/4 top? BEST ANSWER: I can't recall what length I actually used, but my top is only 1 1/2" so they could not have been longer than that. I could be wrong but it certainly gives no indication that it is going anywhere. Keep in mind that all of the force from clamping will be lateral. 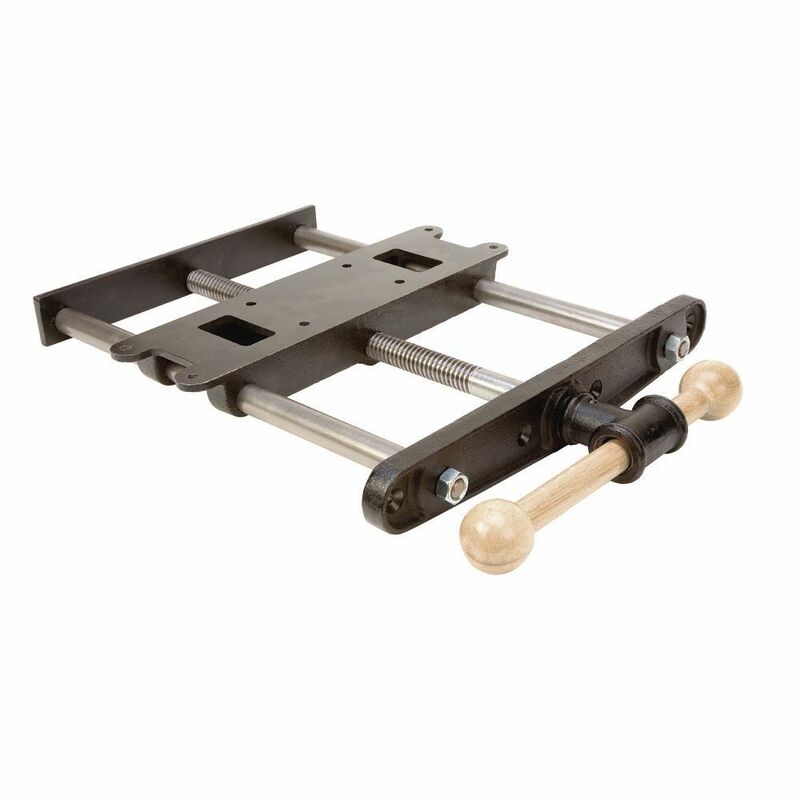 What is the minimum overhang you need to mount the vise plate? I read on amazon someone posted 4 11/16 but I wanted to verify as I will be starting a bench before I purchase his vise. BTW - I'm not looking for the space needed including the guide rods, just the width needed to mount the vise plate. BEST ANSWER: you need 9 3/8" minimum. better to plan for 9 1/2" wide. What is the total depth of this vise ie. From top of mounting plate to lowest point of the vise? BEST ANSWER: From the mounting plate to the bottom of the vise (the quick release mechanism) it is 2-1/2" thick. How thick of bench will this mount too? What is the depth of this vice when fully closed without the wood? I am building a bench with a jog in the bottom and need to know where to step the thickness. It says it has 13" jaw opening, but that still done not give me the answer. The PDF also shows all dimensions except that one. What size are the wood facing? Also 1/4 lug nuts does not appear to be correct. My Rockler vine no longer will lock tight after some years of use. Do I need to replace the locking brake? I am going to build a 4x4work bench and what kind of wooden vise do I need?